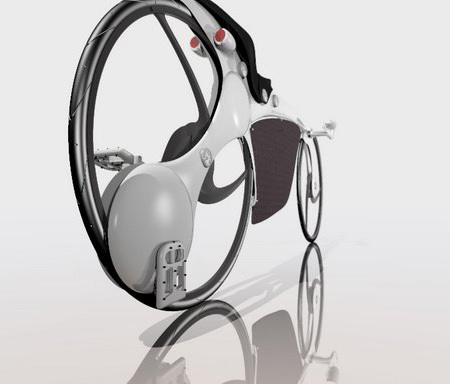 The collapsible bicycle concept designed by Blair Hasty was primarily designed as a vehicle for daily transport usage. 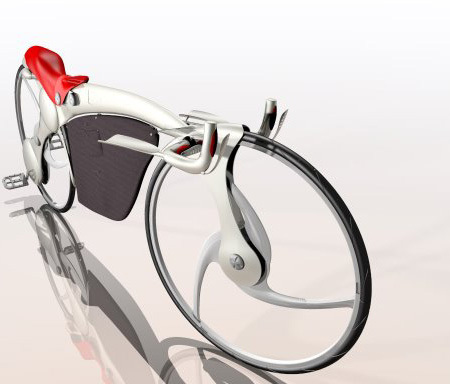 Featured in the 2004 International Bicycle Design Competition in Taiwan the concept has the pedals shifted to behind the driver so the overall weight transfers from the lower back to forearms and pelvic bone and the posture while the rider is prostrate while riding the bike. 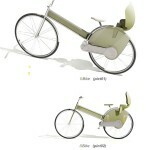 The designer has utilized the space by placing a large bag at the creating thus creating storage space for the rider. Also to add on it is collapsible and the bag comes handy then. 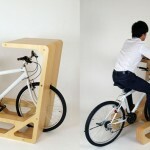 So no need to look for parking space, take it straight to your workstation, plus it is healthier for your body by using bicycle for daily activities. 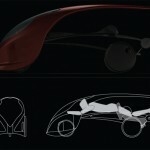 This project started for me in the broad category of personal transportation. 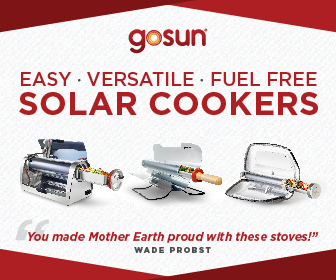 Having seen numerous recreational products win previous design competitions, I resolved to develop a product that would not only be ecologically friendly but also offer health benefits to travelers. After some strong consideration it occurred to me that the large majority of unhealthy, polluters in our society were the millions of people sitting in their cars going to and from work every day. Perhaps many of them would like to commute via man-powered vehicle but simply haven’t found the right solution. I immediately set out to try and found what problems people had with the existing products. I began my design by solving the problem of user posturing. 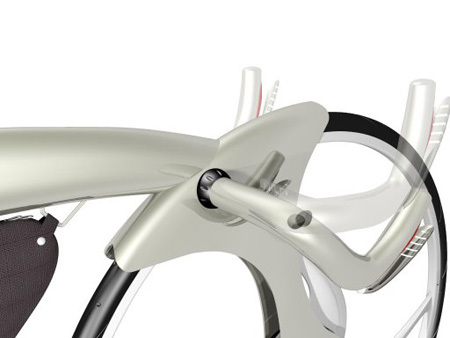 In traditional bike designs the rider’s feet are underneath them causing their torso to hunch forward in order to reach the handles. This results in unnecessary strain on the lower back, arms, and buttocks, not to mention poor aerodynamics. As illustrated I resolved these issues by moving the position of the pedals behind the rider and moving some of the pressure of their body weight onto the front of the hip bones, using a broad front section of the seat and onto their forearms with supports protruding from the handles. The new riding position helped solve the storage problem by freeing up plenty of useable space beneath the rider. In this newly acquired gap I decided to suspend a large bag for cargo. And as for the storage of the bicycle, after the destination has been reached and the cargo contained within the bag has been removed, it can be expanded and the bike can be folded and placed inside. By trying to promote bicycle commuting this product not only benefits the user by making them happier and healthier but also society as a whole by reducing the amount of automotive emissions. Tagged as bicycle commuters, bicycle design, design competitions, international bicycle, product parameters, weight transfers. How's that position for climbing hills? . 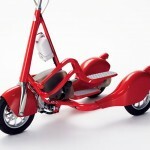 Try riding a recumbent up a hill, similar positioning, just on your backside instead of on the jewels. Being over the bottom bracket enables the rider to produce a lot of power. How about visiblity in traffic? 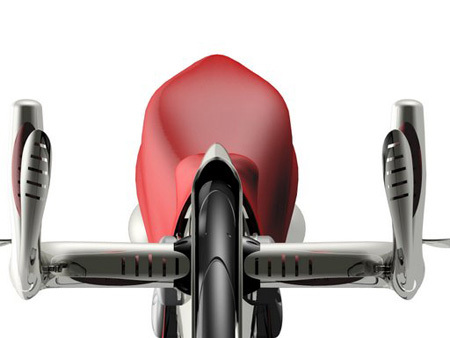 It's more aerodynamic but much lower to the ground, much more difficult for traffic to see the rider. Kind of like a recumbent rider. This design may work well for a HPV (Human Powered Vehicle) race on the Bonneville Salt flats, but I would be weary about trying to ride it up and down hills in traffic. If you find some information on this bike please send it to mm. Lets begin with a compliment the design looks absolute stunning. The folding of the wheels makes the wheel mechanically much weaker (think also about torque forces applied on the bike by the cyclist. The benefit of folding the wheel is minimal if it even is a benefit period because the package becomes ticker. I also miss a supporting device for the chest area which should be mounted on the frame. This in order to prevent strain injurries on the backbone. 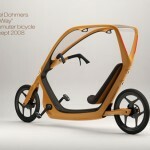 In London there is a recumbent manufacturor that manufacturs this type of recumbents. When the cyclist leans with his/ her underarm on the steeringwheel this can lead to steering errors followed by a fall/ traffic accident. Study existing recumbents of this type and you will see what I mean. This is only good for a race bike concept. stability is to poor. especially when slowing on hills. unable to deliver power on hills also. Hazard to the traffic. I would much rather sit on my bum than on my balls wouldnt you? aerodynamic advantage yes, but with endulating terrain getting to work is aerodynamics neccessary? 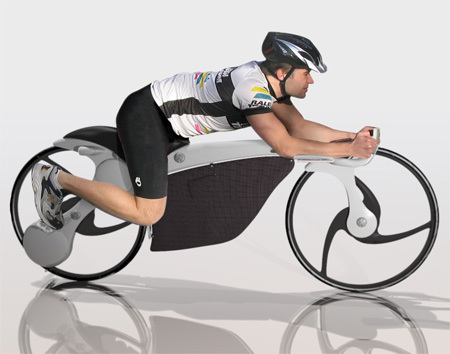 I am currently designing a bike with similar posture, but it is targeted at specifically flat ground sprint racing with prefrably no traffic. How does the gear system work, is it practical. 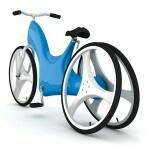 The feature i like most about this design is the foldable wheels.. thats a winner. Well there are a few things that I like about this idea for sure. It looks very sleek and possible to do, but a couple things need to change. First, there needs to be chest support and adjustable chin support. 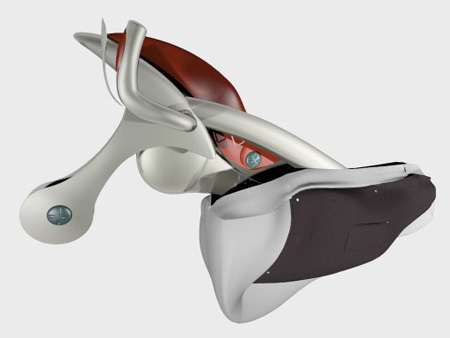 This would allow the user to have minimal strain on the muscles in the neck and lower back. Also, there would have to be a special fall-through area in the support pad for men to position their junk. Second, the bag is unnecessary. There are already add-on bags that strap to the top bar just like yours. They may be less aerodynamic, but are more practical. 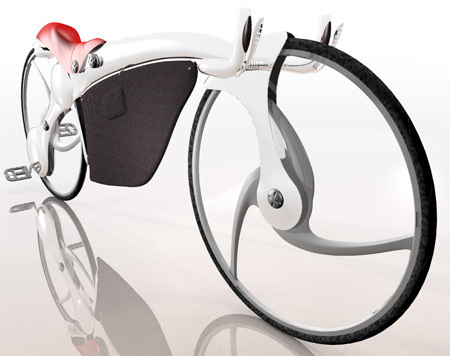 Finally, the folding wheel is unnecessary. 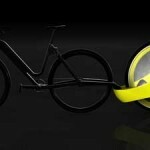 Use a wheel design that allows for bikers to use traditional tires and you will make this thing much more practical. Where do I start? If you want to be a designer you first need to learn that you are not that smart, and that your experience is miniscule. Take for example … hell, take take any of a dozen aspects of this bike and run it past someone with experience, they will explain in seconds why it is fundamentally dumb. I suggest you take every single idea that you consider original in any way and present it to people who are capable of judging it. 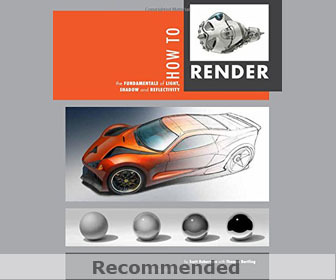 I am not saying this so that you can learn to do a better job, I am trying to get you the feedback that would make you to realise that you are fundamentally unsuited to working in mechanical design. Despite making some effort you have utterly failed to grasp the details or even the basics of how a bike works and what a rider needs. This is not a fixable problem. Do something else. Your interest obviously is in styling, so choose a field where you have freedom to style stuff without screwing up usability. A little harsh there buddy. This is a concept. 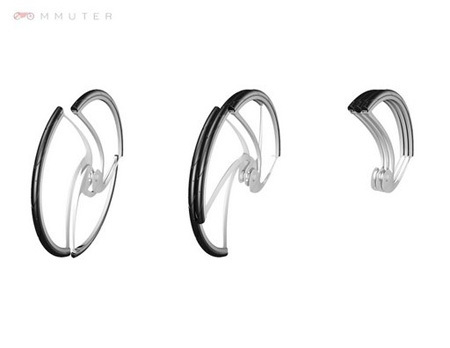 It can be reworked from a mechanical engineering standpoint and still fit the design intent. Obviously some of the mechanisms shown are not practical, but that doesn't mean they can't be redesigned based on standard (existing) components. Daily transport??? Try weaving through traffic on this. 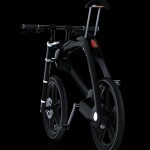 Every bike “designer should be made to ride their own bike for 50-100km. My first question always is – is it practical? For example, when the front wheel turns while biking in wet weather, it looks like the rider will get a facefull of spray from the front tire. That wouldn't be nice. Also the rider seems to be lying on his crotch rather than his bum. Could be painful on longer journeys. Personally I don't understand how futuristic concepts often dispense with practicality. Functional practicality is essential and should be at minimum *as good as* contemporary equivalents, and ideally much better. Otherwise it'll remain just a concept. 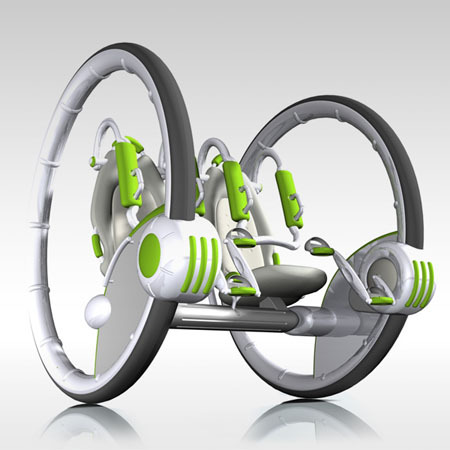 i like the wheel foldable system, can be joined and work with the project named ERW (Energy Returning Wheel). I ever think in a project like these kind of wheel, but i had though in a kind of leak (fan hands). This design and structure of cycle is classy but pedaling on back wheel would be uncomfortable for older age people because they could not be straight as cycle structure.